WASHINGTON — The United States is stressing its support for renegotiating a three-country NAFTA agreement after comments from an American lawmaker suggesting it was considering splitting Canada and Mexico into separate talks. 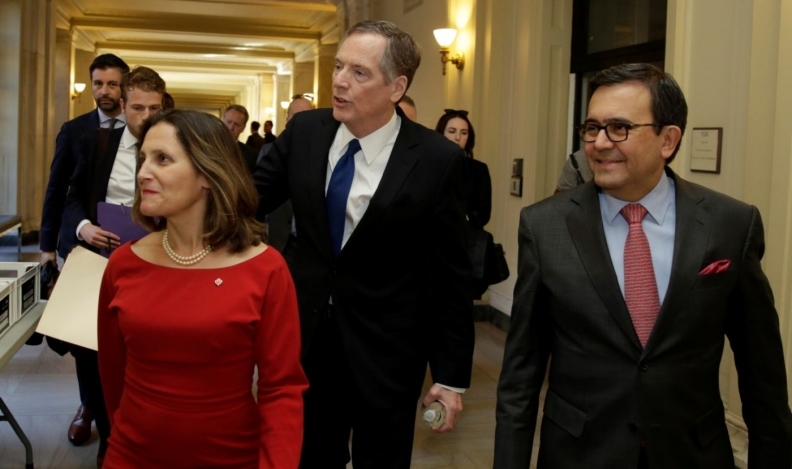 "The U.S. objective has been and remains renegotiating and modernizing NAFTA on a trilateral basis," Amelia Breinig, a spokeswoman with the United States trade representative, said in a statement Wednesday. "With six rounds of renegotiations completed, some progress has been made, but not nearly enough. As we said [at the last round] in Montreal, we all must redouble our efforts at this crucial time." That statement came after a moment of confusion on Capitol Hill. U.S. trade czar Robert Lighthizer held a rare briefing on the state of NAFTA with American lawmakers, updating one of the two U.S. congressional committees overseeing trade. One of the congressmen left that meeting saying it appeared the American side, frustrated by the pace of talks with Canada, was considering concluding a quick agreement with Mexico — and sorting out a deal with Canada later. "He thinks more progress has been made with Mexico. And that there might be a way to wrap things up and down and just maintain ongoing negotiations with Canada at that point," said Ron Kind, a Wisconsin Democrat. That ambiguity lingered as three other lawmakers who left the meeting wouldn't confirm or deny what Lighthizer said. The U.S. trade czar, for his part, also refused to discuss it: "You know I don't talk," Lighthizer said as he left the meeting. Some meeting participants said any talk of splitting up the negotiations might be tactical — to simply up the pressure on Canada to accede to U.S. demands: "Negotiations are all about leverage," said Brian Higgins, a Democrat from upper New York state. One of biggest wedges between Canada and the United States is the U.S. demand to increase the threshold governing rules of origin in automobiles and parts to 85 per cent from 62.5 per cent, with a 50 per cent carve-out for U.S. parts and material. Canada has rejected that idea. Some Democrats called it strange to say things were going more smoothly with Mexico — when the most fundamental issues involve Mexico and have yet to be settled, including labour rights, outsourced jobs and auto rules of origin. Sander Levin said the U.S. administration might be annoyed at some of Canada's recent trade moves, but he doesn't see how the dynamics of the negotiation have changed much since the U.S. supposedly entered these talks to bring back manufacturing jobs from Mexico. "I think Canada's filing the [World Trade Organization] complaint [against the U.S.] was very unsettling," Levin said. "But my own judgment is in terms of the basic issue, with Mexico, they're moving backwards ... I don't see how when they're moving backwards on this key issue, with Mexico, that it makes much sense to talk about a separate agreement with Mexico." Many U.S. lawmakers are critical of their own government. There is little appetite on Capitol Hill for ending NAFTA — and many lawmakers view their own administration's behaviour as jeopardizing the agreement. The Democrats are more vocal about it. "We've got a president who is impulsive and incoherent at best. And he started all this," Higgins said, adding that there likely can't be an agreement unless it satisfies Trump's demand to reduce America's import-export deficit. Kind said the U.S. approach has been all wrong. He accused the administration of strong-arm tactics designed to make enemies — not deals. "Since we're the biggest dog on the block, [Lighthizer thinks] everyone should just succumb to all our wishes," he said. "I'm just concerned. If we drop the ball on this, if we can't figure out a way to live in peace and harmony with our two border neighbours, there's not a country in the world that's going to have an interest in sitting down and negotiating with the United States of America. What's the point?"